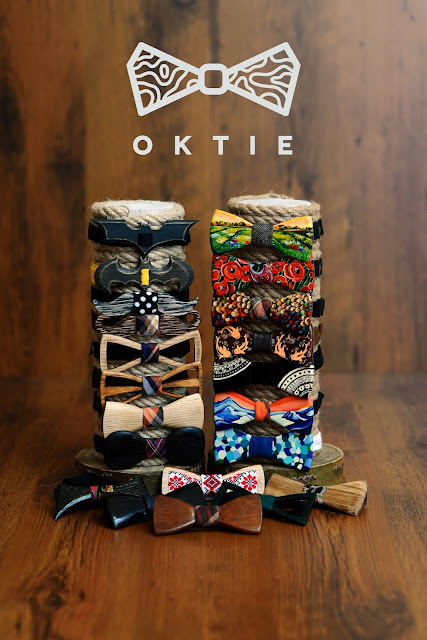 Hello, My name is Pavlo and I'm creator of OKTIE wooden accessories. How does I start doing it? All started summer 2014 when my friend professional wedding photographer (as I am) asked me to help him with wedding shots he made to complete them in short time. Groom on that pictures had an excellent wooden bow tie, I haven't seen wooden bow ties before and it's impressed me so I desired one to myself, but I couldn't find that tie anywhere so I tried to made it on my own. 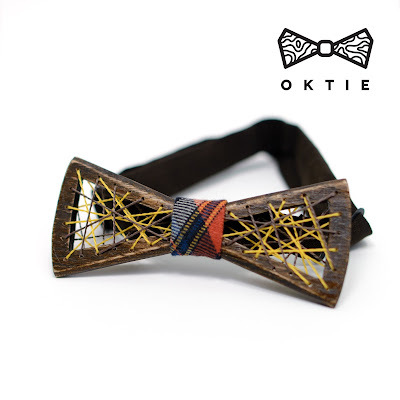 In a process I added some few thins from My self and create absolute new and unique bowtie (it presented in my store as OKTIE 1 ). That tie impressed few of my closest friend and I made as a gift for them some new ties. After a while people started ask me about my ties and making orders - so I decide to make a production and sale my product. All that time I was making all the wood works and my mother helped me with sewing works on bowties, so family business started. Along that my mother made some knitted clothes and accessories for children and clothes for woman. At the end of 2016 my girlfriend Ira decided to try herself in my workshop and she like it so she start to make woman's accessories line that I newer have time to do. Now she creating a create wood-resin jewelry. Our workshop based in a small apartment, for a first time it was on a balcony, but wither came and I moved it to the kitchen, working with wood in the small apartment creating a huge mess and noise for the neighbors so if closest future we want to move into the normal shop place. Now we trying to collect money for that purpose. We using only Eco clean and friendly materials. We purchase our wood only from authorized sellers. We use mostly Ash and Oak wood but we like to experiment time after time. We always have a new bright ideas and willing to create something spectacular new to make you happy. So welcome to my store and hope you will enjoy my work! We using only Eco clean and friendly materials. We purchase our wood only from authorized sellers. We use mostly Ash and Oak wood but we like to experiment time after time. All our products made by our hands all tools are not automated. Creation process generally take 3-5 days this is required to wood well dry out so you get nice and smooth product. Custom OrdersAverage Production Time for Custom Orders: 5 daysCustom Order Options: We can made any customization you want from changing color of fabrics or making a personal engraving on the gift box to create a complete new order whatever you wish. Just tell us and we will make it for You.